This is one of the flattest felixwong.com self-supported centuries. 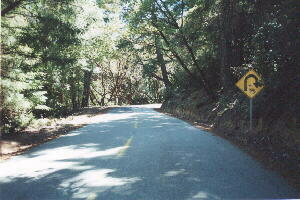 The only significant climb is Kings Mountain Road in Woodside, which is a 5-mile climb to the top of Skyline Blvd. Not surprisingly, Kings Mtn. and Skyline are also the most scenic parts of the ride! R. (north) on Middlefield Rd. L (west) on Ravenswood Rd. R (north) on University for a couple of blocks. ~17 L (west) on Santa Cruz Ave.
L (south) on Junipero Serra. 10 Straight (south) on Foothill Rd., all the way to Stevens Creek Park. Take a lunch break at Stevens Creek. 5 R (north, then west) on Kings Mountain Rd. R (south) at sharp fork at bottom of CA-84, to Portola Rd. R (west, then south) on Portola Rd. L (east) on Alpine Rd. ~71 L (east) on Campus Drive West, through Stanford. L (east) on University, through Palo Alto, to Dumbarton Bridge bikeway. R (south, then eventually east) on Thornton Rd. 3 R (south) on Cherry St.
L (east) on AutoMall Parkway (becomes Durham). Keep going even further than I-680. L (north) Paseo Padre Rd. The hill right there is steep but short. Go for it! 95 4 Finish at Central Park in Fremont. Good job. Rode over to Mike’s place in Menlo Park again from Fremont. From his place we rode from Mile 19-44, basically just going to Stevens Creek Park and back up Foothill. Foothill is such a fast road! After that went solo up Kings Mountain. Despite the lack of training, wasn’t climbing that poorly and was concentraing on good form. Going down Skyline is fun with the long sweeping corners. Down CA-84 was fun too as there weren’t too many cars on this Saturday. Rest of the ride was windy but unremarkable, until the Paseo Padre hill at Mile 91. Earlier in the week I was really impressing myself by going up at 13mph and not having to resort to the granny. Was feeling strong then! But today I could hardly muster 4mph and my legs were cramping. I seriously need to train more for better endurance and hill-climbing!